The best training programmes take into account the key variables for your goals. And if you want to get stronger, the key things to focus on are the weight you’re lifting and the volume (total work) you perform. Doing five sets of five reps is a great way to get the best of both. 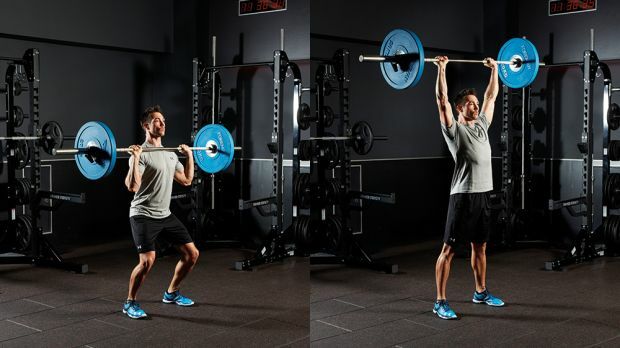 A five-rep set will simultaneously allow you to lift heavy while also completing a relatively high number of total reps. We’ve selected three moves for you to focus on and built workouts around them that will have a huge impact on your full-body strength. 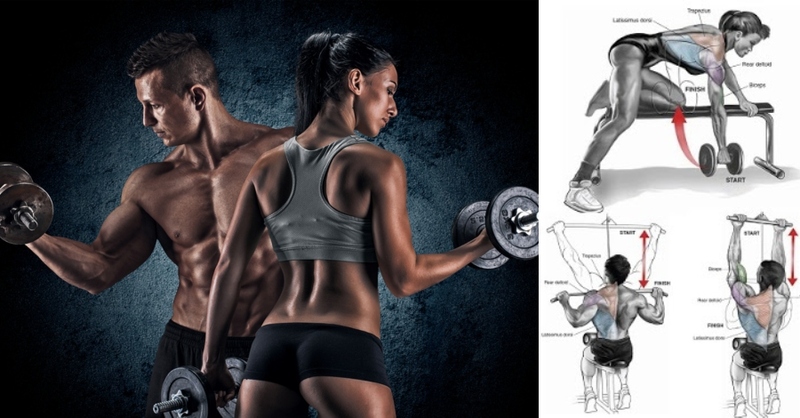 Do each workout once a week for six weeks, aiming to slightly increase the load on each lift every time you train. Why: This will get you moving in the right way to gear up for your main lift of the session, the barbell squat. It’s a fairly light way to ease into the session, which will allow you to focus on depth. Having the weight in front of you also encourages you to keep an upright torso. 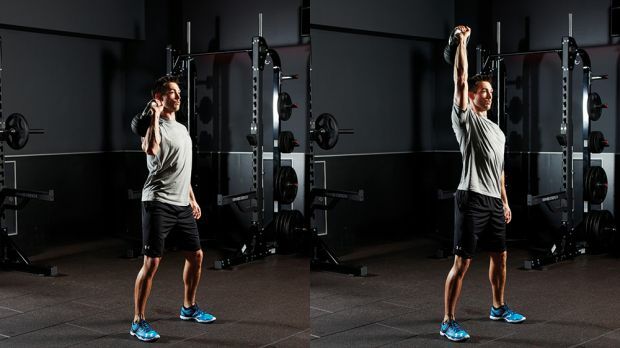 Hold a kettlebell by the horns in front of your chest. Simultaneously hinge at the knees and hips to lower as far as you can, keeping your weight on your heels and mid-foot. 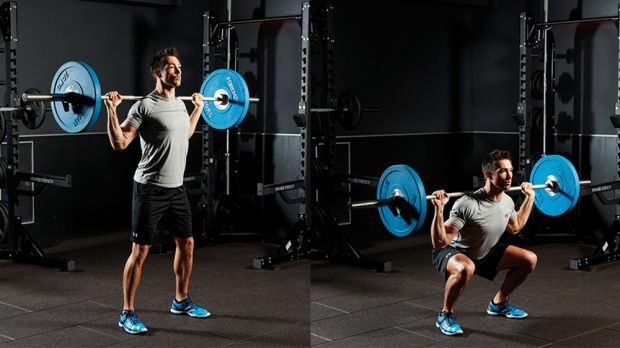 Why: This explosive move will activate your fast-twitch muscle fibres, priming your nervous system so you get maximum muscle fibre recruitment when you perform the heavy sets in the next exercise. The rep count is low because this is about quality of movement rather than exhausting your target muscles. 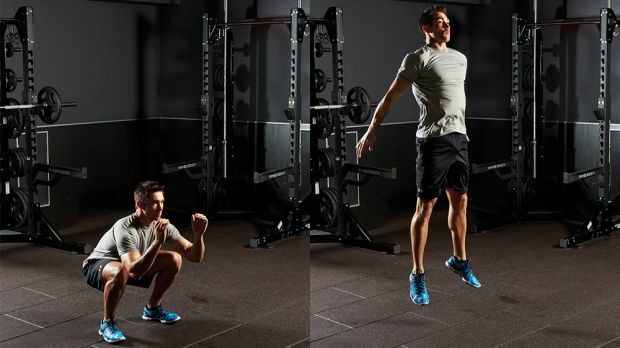 With feet shoulder-width apart, squat down, then explode up to jump as high as you can. Land softly and go straight into the next rep.
Why: This is the main move of the workout, so it demands maximum focus. The squat is one of the most effective strength-building exercises you can do. You get more rest than usual to allow your body more recovery so you can lift the maximum weight possible. With the bar on your back and your feet shoulder-width apart, simultaneously bend at the hips and knees to lower into a squat. Lower as far as you can, keeping your weight on your heels and mid-foot and your chest up. Push your elbows forwards to engage your lats and prevent your spine from bending. Why: A heavy squat requires a strong core to keep your torso upright. This move will build strength and stability across the whole of your abs, lower back and deep-lying core muscles. Get into position with your body in a straight line from head to heels and your elbows directly below your shoulders. If your hips are too high that will take tension off the core muscles. If they are too low it will put strain on your lower back. Why: This move will warm up your shoulder joints, which are complex and can get injured easily. The single-sided nature of the move means that your stabilising muscles are activated to control your movement. With your elbow below your wrist and the kettlebell resting on the back of your wrist, press the weight directly overhead. Lower back to the start under control. Swap sides after five reps.
Why: Being able to press a heavy weight overhead is a good sign that you have structural integrity in your shoulders and upper spine, as well as good core strength. 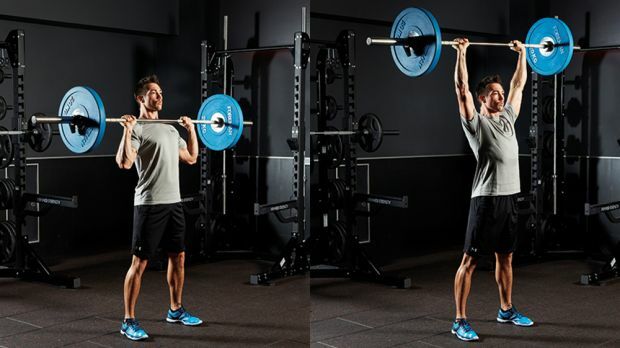 Start with the bar on the front of your shoulders, gripping it with hands just wider than shoulder-width apart. Squeeze your glutes to give yourself a stable base and activate your core, then press the weight overhead. Only lower the bar to just below chin height to avoid internally rotating and over stressing your shoulders. Why: This exercise is a good way of fully fatiguing your shoulders after they’re no longer able to complete strict overhead press reps.
Bend at the knees slightly, then straighten up and use the momentum to assist pressing the bar overhead. Why: A good overhead press requires you to be strong in the core, particularly when your arms are above your head. 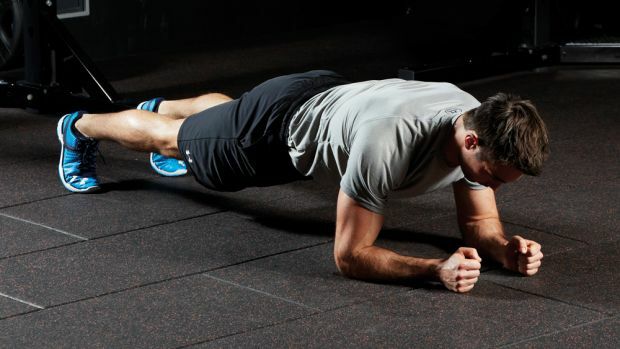 This dynamic movement mimics that position to give you a direct abdominal strength benefit. 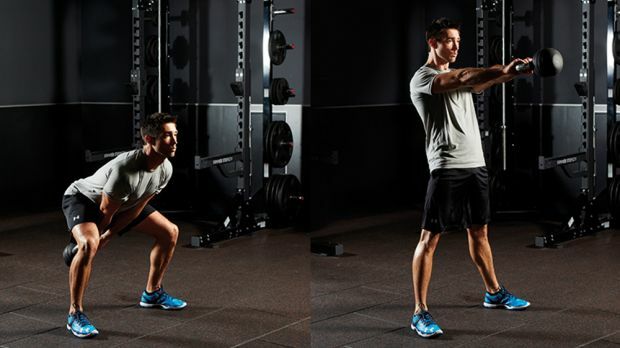 Start on your knees with your shoulders above the bar and your arms straight. 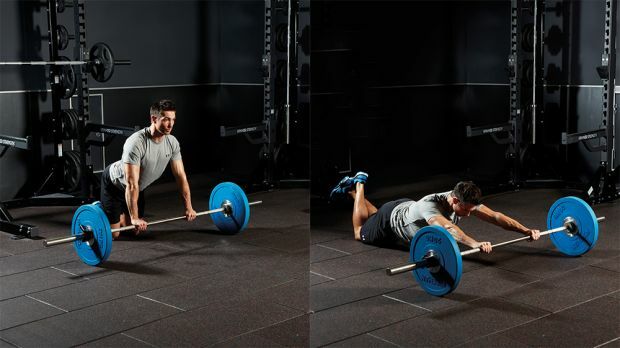 Contract your abs, then roll the bar out in front of you. Go as far as you can, then roll the bar back to the start. Why: When done properly, the kettlebell swing is a hip hinge rather than a squatting movement. Drilling that movement pattern will help you engage your hamstrings and maintain good form during a heavy deadlift. Holding the bell in two hands, swing it back between your legs and then straighten up with a hip snap. The key to a good swing is hinging at the hips and straightening up powerfully so that the hip drive, rather than your arms, is responsible for moving the weight. 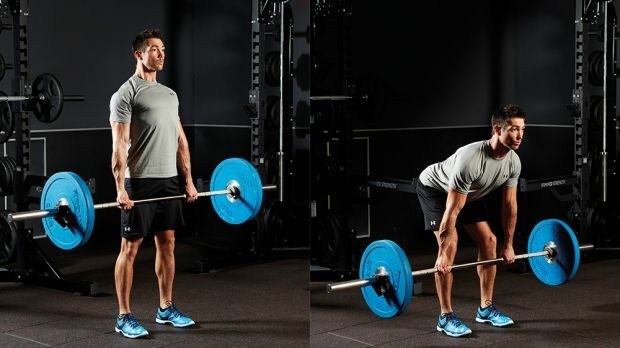 Why: The deadlift is arguably the most effective whole-body strength and muscle builder. It also focuses on your posterior chain – the muscles on the back of your body, which many people leave under trained but which play a key role in promoting good posture and keeping you injury-free. Set up so you’re gripping the bar overhand, hands just wider than shoulder-width apart. Initiate the movement by loading your hamstrings and straightening your legs. Once the bar is past your knees you can straighten up. Why: After your heavy deadlift sets this is a good way of developing the hamstring strength needed to improve your deadlift. It’s technically a lot easier than the deadlift so you’ll be able to go reasonably heavy even when your muscles are tired. Hold a barbell with an overhand grip just outside your thighs. Hinge at the hips to send the bar down the front of your thighs, ensuring that the bar stays close to you throughout the lift. Lower until you feel a strong stretch in your hamstrings, then straighten back up and contract your glutes at the top of the move. 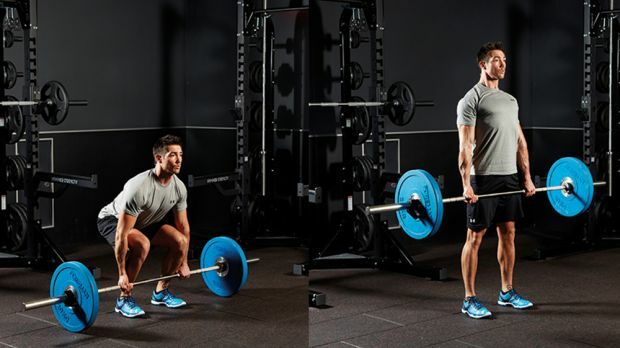 Why: Strong glutes are vital for a big deadlift and this move targets them directly. Rest your upper back on a bench and hold the barbell on your hips. Push your hips towards the ceiling as far as you can while squeezing your glutes together. Lower your hips under control, then repeat. 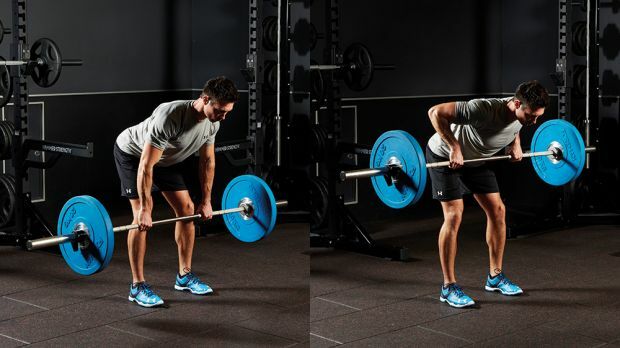 Why: You can’t hit a big deadlift if you have a weak back, and this move is great at strengthening your larger back muscles. Hold a bar with an overhand grip and bend at the hips to let the bar hang down at knee height. Pull your elbows back to bring the bar up to your bellybutton, then lower back to the start.